The NEC N8000-8865 is a single board computer featuring 320GB hard drive and Windows 7. This system is designed to increase flexibility for users of any digital signage application. The single board computer features Intel Core i5 3610ME 2.7GHz CPU and was designed with display integration. It also eliminates the need for an external PC, cabling, mounting, and power supply owing to NEC displays' expansion slots. The N8000-8865 allows it to run most third party software and custom applications. Ths module supports 1080p video playback and Windows OS. It is ideal for markets such as digital signage, quick-service restaurants, education, medical, retail, and rental staging. 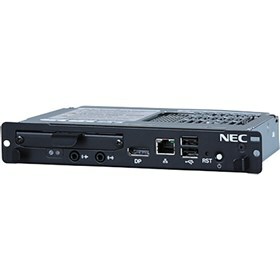 The NEC N8000-8865 has many exciting features for users of all types. The NEC N8000-8865 is sold as a Brand New Unopened Item.